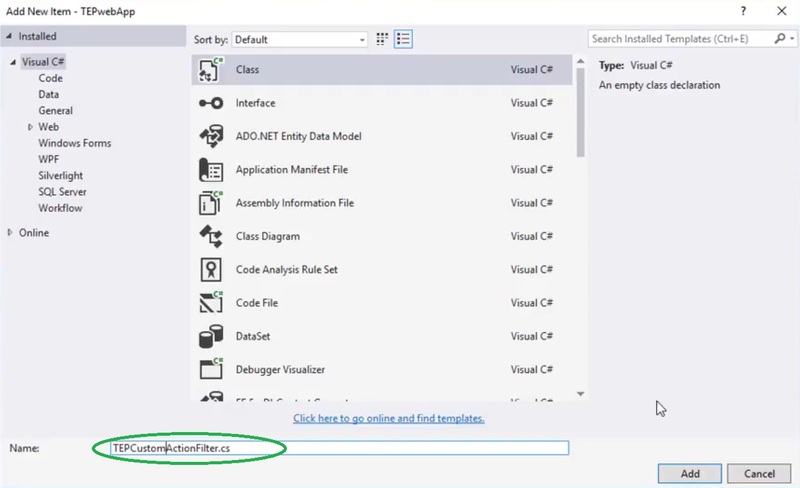 A complete step by step tutorial on How to Create a Custom Filter in ASP.NET MVC. Hello friends, I hope you all are doing great. 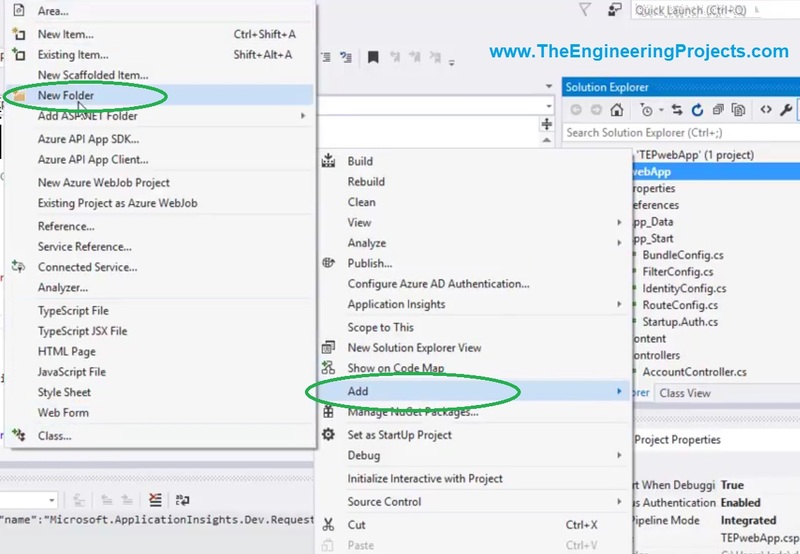 In today’s tutorial, we will have a look at How to Create a Custom Filter in ASP.NET MVC. It’s our 10th tutorial in ASP.NET MVC series. In our previous tutorial, we have cleared our concepts about Filters in ASP.NETMVC and we have also implemented one built-in filter of ASP.NET MVC. In ASP.NET MVC, custom filters are handled by a base class named as ActionFilterAttribute. This ActionFilterAttribute class implements both IActionFilter & IResultFilter. Although ASP.NET MVC has numerous built-in filters but in many cases, there comes a need for custom rules or handles. In such cases, we need to design our custom Filters using ActionFilterAttribute. 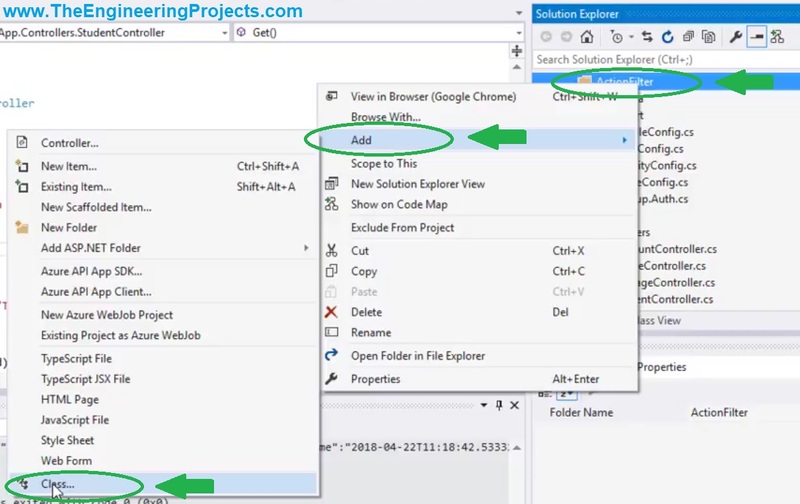 In your Solution Explorer, right click on the Main project and click on Add and then click on New Folder. It will create a New Folder in your project, rename it to ActionFilter. It will open up a new pop up window, where you need to select class and then give it a name. Now click the Add Button and a new class will be added in your ActionFilter folder and will also open up in your workspace. We need to derive this class from ActionFilterAttribute that why I have extended the class name. We need to include System.Web.Mvc in order to use ActionFilterAttribute. In the class, I have created a simple function in which I am displaying a text on the output debug pane, after the execution of my project. 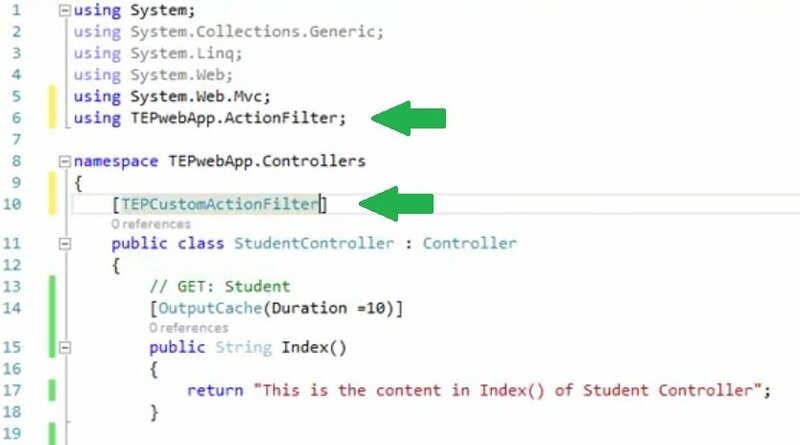 So, we have created our custom filter, now it’s time to add it in our StudentController which we have created in Tut # 6: Create a new Controller in ASP.NET MVC. First of all, we need to add our package TEPwebApp.ActionFilter, ActionFilter is the name of our folder we created for our custom filter. 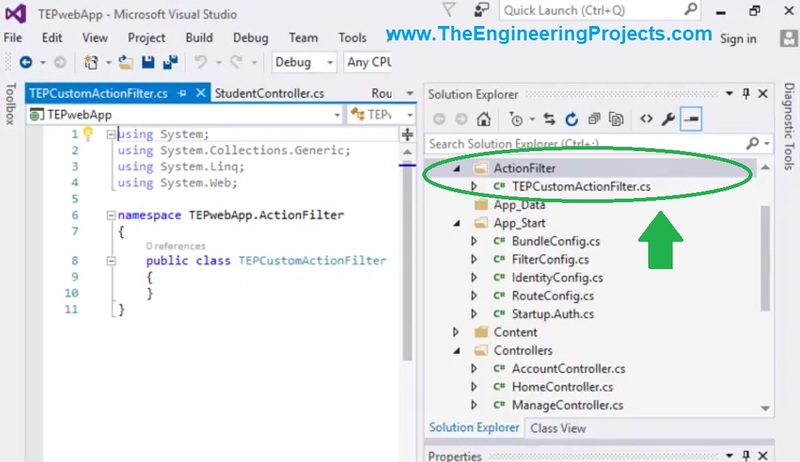 Now before the StudentController class, place the code for our newly created custom Filter [TEPCustomActionFilter]. Now run your project and after website opened in the browser, stop your project and check your Output Pane. I have highlighted our Text in the above figure. So, our filter has executed after the StudentController class and it has displayed the info. Such Filters are used for listening purposes, we can listen different types of data through them. So, that was all about How to Create a Custom Filter in ASP.NET MVC. I am just focusing on the basic details here, we need to clear our concepts first and with practice we can become pro. Will meet you guys in the next tutorial, take care and have fun !! !